Sgt Alexander Blackman, of Taunton, was found guilty of murder at a court martial in November 2013 for murdering an insurgent in Afghanistan. The 2011 Helmand Province incident was the killing, on 15 September 2011, of an injured Taliban insurgent by Royal Marines. Three Royal Marines, known during their trial as Marines A, B, and C, were anonymously tried by court-martial. On 8 November 2013, Marines B and C were acquitted, but Marine A was found guilty of the murder of the Afghan combatant, in contravention of section 42 of the Armed Forces Act 2006. This made him the first British soldier to be convicted of a battlefield murder whilst serving abroad since the Second World War. Later, on 5 December, Lord Chief Justice Lord Thomas and two other High Court judges lifted the existing anonymity order on Marine A, allowing him to be named as Sergeant Alexander Wayne Blackman. On 6 December, Blackman was sentenced to life imprisonment with a minimum term of 10 years, and dismissed with disgrace from the British Armed Forces. On 22 May 2014, the Court of Appeal reduced his minimum term to 8 years. On 19 December 2013, the anonymity order on Marines B and C was also lifted by the Court, and they were named as Corporal Christopher Glyn Watson and Marine Jack Alexander Hammond. The incident took place in Helmand Province during Operation Herrick 14, part of the British effort in the War in Afghanistan. Blackman, of 42 Commando, Royal Marines, was part of a Marine patrol that came across an Afghan fighter in a field wounded by Apache Helicopter gunfire. After the 15 September incident, Blackman continued with his tour of duty, leaving Helmand Province in late October 2011. On 13 October 2012, at the decision of the Service Prosecution Authority, Marines A–E were charged with the murder of the unnamed Afghan insurgent. The lead came after British civilian police discovered suspicious video footage on a serviceman’s laptop. Marines D and E had charges against them dropped on 5 February 2013. Marines A, B and C first appeared in court in August 2013, where they entered a not-guilty plea. The military trial of Marines A, B and C, protected from view in court behind a screen because of an anonymity order, began on 23 October 2013 and lasted two weeks. Their court-martial board (equivalent to a jury in the civilian justice system) was seven strong, something usually only done for the more serious cases. The verdict (8 November 2013) and sentence (6 December 2013) were both delivered at the Military Court Centre in Bulford, Wiltshire. The judge advocate (the civilian judge heading up the panel at a court-martial) was Judge Advocate General Jeff Blackett. The verdict carried with it a mandatory life sentence, so it was only in the judge advocate’s and court-martial board’s power to decide on the minimum sentence once the board had found Blackman guilty. He was sentenced to a minimum of 10 years in prison. On 22 May 2014, at the Courts Martial Appeal Court, its most senior judge, Lord Chief Justice Lord Thomas, upheld the life sentence, but reduced Blackman’s minimum term to 8 years. Running in parallel to the Marines’ criminal trial were legal proceedings relating to the anonymity of the defendants. In the autumn of 2012, Judges Advocate Elsom and Blackett issued anonymity orders for the Marine defendants due to the risk that, once named, the defendants would become targets for terrorists. The move had been opposed by elements of the UK media. A lawyer for the Press Association argued that anonymity orders should not be issued in this case because, firstly, British military award recipients named in the media had not been previously targeted; and, secondly, that the names of those British service personnel investigated following the death of Baha Mousa had not been similarly protected. The 2012 anonymity orders were upheld at the beginning of the trial in October 2013. The order was lifted for Blackman (hitherto Marine A) on 5 December 2013 by the High Court. The most senior figure involved in that verdict was Lord Chief Justice Lord Thomas. The same ruling had it that the identities of Marines B and C also be revealed unless they submit an appeal to the Supreme Court. No such appeal was lodged within the set deadline, and so, on 19 December 2013, Marine B was named as Corporal Christopher Glyn Watson and Marine C was named as Marine Jack Alexander Hammond. The anonymity of Marines D and E was upheld on 19 December “pending any further order by the Judge Advocate General“. On 5 December 2013, the Court Martial Appeal Court upheld the earlier decisions prohibiting the release of the video footage of the attack and some of the stills from it. The Court stated, however, that the prohibition was to prevent the material being used for radicalisation, rather than it posing a risk to the life of the defendants. The legal proceedings relating to the Marines garnered widespread British public and media attention. 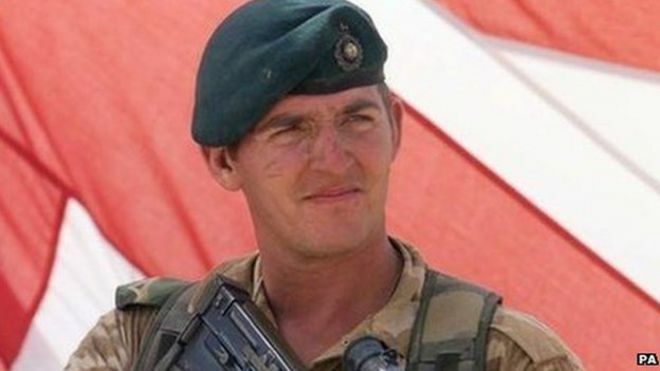 Reacting to Marine A’s guilty verdict, Royal Marines Brigadier Bill Dunham called the murder a “shocking and appalling aberration” that was “not consistent with the ethos, values and standards of the Royal Marines”, but was nevertheless an “isolated incident”. General Sir Mike Jackson said he was “saddened” by the case. Marine A’s guilty verdict led to a showing of public support for the Marine, with people creating social media groups and online petitions alternately asking that he be given a lenient sentence and calling for his release. The Daily Telegraph supported this movement. When Blackman was sentenced to 10 years, General Sir Nick Houghton called his actions a “heinous crime” and commented that “murder is murder”. By contrast, Blackman’s commanding officer, Lieutenant Colonel Simon Chapman, 42 Commando, said in a letter read to the court that Blackman had had a “momentary … lapse of judgment” and was “not a bad man”, and added that Blackman had his “full support”. Blackman himself said in a statement that he was “devastated” and “very sorry for any damage caused to the Royal Marines”. As far as I knoq this man was suffering from extreme bartle fatgue. He had also seen one of his you soldier’s arms and legs hanging in a tree as trophies! If the boot had been on the other foot they wouldn’t have been given a bullet butno doubt tortured! I wonder which one if us wouldn’t have done the same given the circumstances. This man has been ” hung out to dry” by the military! !